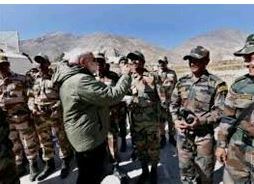 STORY: Indian Prime Minister, Narendra Modi, on Wednesday (November 07), celebrated Diwali (Festival of Lights) with Indian Army near the India-China border in India’s northern Uttarakhand state. The PM fed sweets to the soldiers with his own hands and was also seen interacting with them. Chief of the Army staff, General Bipin Rawat was also seen at the event. From here, Modi headed to the Himalayan shrine of Kedarnath, and worshipped Hindu God of destruction, Shiva. Diwali is celebrated with great fervour and revelry all over India as it marks the return of Hindu god king Rama to his hometown of Ayodhya in northern India after he defeated Ravana, the powerful demon king of Lanka. Diwali is also celebrated in honour of Lakshmi, the Hindu goddess of wealth and prosperity. It is believed that Lakshmi showers her blessings upon those homes that are clean and well lit. Further northwest, India’s Border Security Force (BSF) exchanged sweets with their Pakistani counterparts at the Attari-Wagah border in Punjab state on the occasion. The tradition is a long standing one between the nuclear-armed rival neighbours as a goodwill gesture on key festivals, to maintain cordial relations.